Summary: Mercy Watson gets a backstory, as readers discover how she came to live with Mr. and Mrs. Watson when she was just a piglet. Turns out she fell off a truck that was rumbling down Deckawoo Drive, landing not far from the Watsons’ house. It was love at first sight when the Watsons found her on their front porch. Of course, Eugenia Lincoln gets in her two cents’ worth, while her younger sister Baby brings the piglet a bottle of milk. Mercy downs the bottle, but her fondness for buttered toast soon emerges, earning her the title of “porcine wonder” from Mr. Watson. The last page shows Mercy in her high chair at the Watsons’ kitchen table, with everyone well on their way to happily-ever-after. 32 pages; ages 3-7. Pros: Mercy Watson readers will enjoy learning Mercy’s early story, while their younger siblings will get to meet all the characters that they’ll see again in the chapter books. 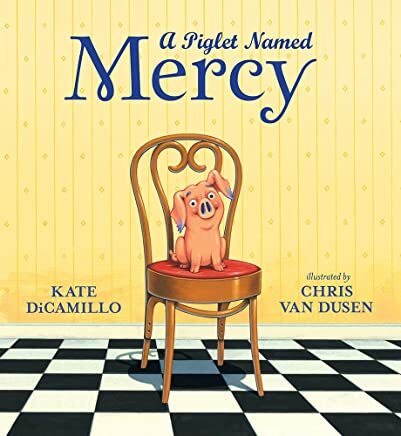 Cons: I wish Kate DiCamillo would write more of the Mercy Watson early chapter books.